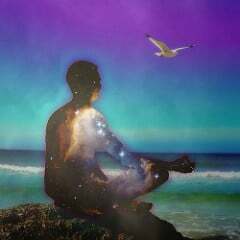 In yogic thought the manifest world is comprised of three basic characteristics called the gunas: energy, idleness, and clarity (rajas, tamas, and sattva) which are always in flux. Every object, every abstraction, and each one of us has some combination of these three components of nature. 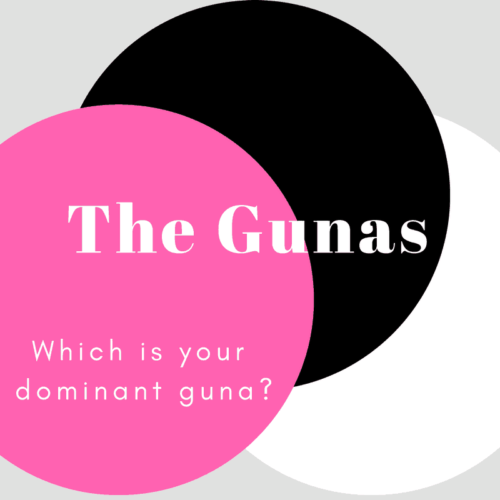 Although the gunas are involved in the perpetual dance of evolution, most of us have arrived to the planet with at least one of them dominating the show. Too much of any single guna causes suffering, and the mission of the yogi is to rise above all three. 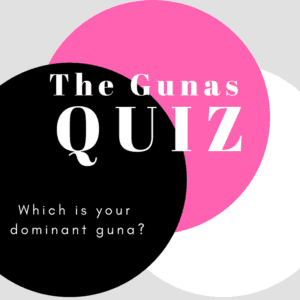 Which guna predominates in you? Take the Quiz. Rajas, the guna most prized in the modern world, gives us energy, alertness, the ability to plan, the capacity for desire, and the power to create change. When in excess, it leads to restlessness, insatiability, greed, anxiety, disappointment, pride, and violence. You can see how having at least some rajas helps us to accomplish basic tasks and achieve goals. However, we tend to have a cultural overabundance of rajas, a situation that has walked us right into excess materialism, uneven wealth distribution, wars over resources, overmedication, and widespread malaise. Tamas gets a bad rap. It’s the slower, duller, lazier sibling to over-productive rajas, but its qualities are just as necessary in the play of life. Tamas is the solidity, stability, firmness, and density of the phenomenal world. It likes to stay put. For humanity, it’s the willingness to rest and to be rather than do; but it’s also the tendency to lose ground, to lose focus, to lose drive, and lose in general. In excess, it manifests as oversleeping and underproducing and its (sour) fruits are delusion and ignorance. The tamasic person would do well to call upon their inner rajas or at least to seek out rajasic company in order to overcome periods of stagnancy. But the project of the yogi is not through when the gunas are in harmony. According to the Gita, we must transcend our material nature, developing dispassion and equanimity in the face of any guna. Many a seeker will at some point strive for a sattvic existence, and no wonder! Sattva is lightness, harmony, peace, and clarity. It’s the etheric cousin of fiery rajas and earthen tamas. Sattva predominates when we are in balance, when we are tapped into intuitive knowing, and when we seem to be led by the guiding hand of the universe. It eschews bad habits and too much ambition, instead doing what is needed and appropriate in each moment without deep attachment or an intention for personal gain. But the story does not end with sattva; the gunas must be transcended. Even sattva has its pitfalls, especially because it can feel so good to be sattvic. The trap is that a sattvic person becomes accustomed to joy and harmony and may not be equipped when difficult realities arise. There is also the risk that a sattvic person might drift into believing that they have reached the final stages of enlightenment (a tamasic delusion) when in reality they’ve just become a gifted manager of mood. Attachment to the sattvic feeling-state can also grow, and a holier-than-thou kind of ‘tude can creep in. Still, sattva is the least dense, most refined of the gunas, the closest state to complete and holy absorption. Study yourself — your qualities, your tendencies, your pitfalls, your strengths — in order to craft as harmonious a life as you possibly can. Svadhyaya enables a life of clear thinking and right action. Svadhyaya is like polishing a mirror. As you come to see yourself more clearly, you begin to understand reality more clearly and you cease to project your own “smudge” on everyone else. Study the texts. The Sutras and the Gita are a great place to start, but look to any teachers, guides, or texts that resonate with you and feel responsible and true. Don’t act on behalf of yourself alone. Act, always, on behalf of humanity, or the Earth, or the universe, or God, depending on your inclination. Acting without attachment leads naturally to a state of peace because we are not deeply affected when we don’t get what we wish for. We aren’t hurt by small sleights, and we maintain calm no matter which of the gunas is arising. When we are acting on behalf of a bigger picture, we don’t push too hard in resistance against any guna. As a result, they are left to dance fluidly without our intervention, as it should be. As I continue to walk my own yoga-inspired journey, I find myself coming back again and again to these two recommendations, which seem to encapsulate so many of the yoga teachings. I find continued lessons as I closely examine my own tendencies, obstacles, gunas, and gifts, as svadhyaya would have me do it. And when I find my own egoic desires coloring my actions in the world, I recall why it is I believe I’m here: to take care of my loved ones and to serve humanity in whatever capacity I can, in every moment possible. The combined practice of honest svadhyaya and acting in service ends up being about staying in close relationship with the best guru there is, the inner guru. May the wisdom of these teachings serve your dharma! Understand the obstacles holding you back from leading the phenomenally and spiritually full life you know you can lead, and understand the strengths that are propelling you toward joy and freedom. 4. ___________ sometimes gets the better of me.